Left: the stipe of fringed sieve kelp (top) is short, flattened, and bears tooth-like projections; the stipe of the similar sieve kelp (bottom) is rounded, longer, and has no projections. Photo by Jenn Burt. Right: fringed sieve kelp on a rocky shoreline. Encrusting bryozoans can be seen as lighter patches on the blade. Photo by Joel White. This brown alga has a single large elliptical blade. The often ragged blade is thin, with scattered holes and a puckered texture, and is commonly encrusted with bryozoans. It has a faint midrib near the base, and reaches 80 cm long. The flattened stipe is 2-6 cm long with tooth-like projections along its margins. The holdfast is a narrow, branched haptera. 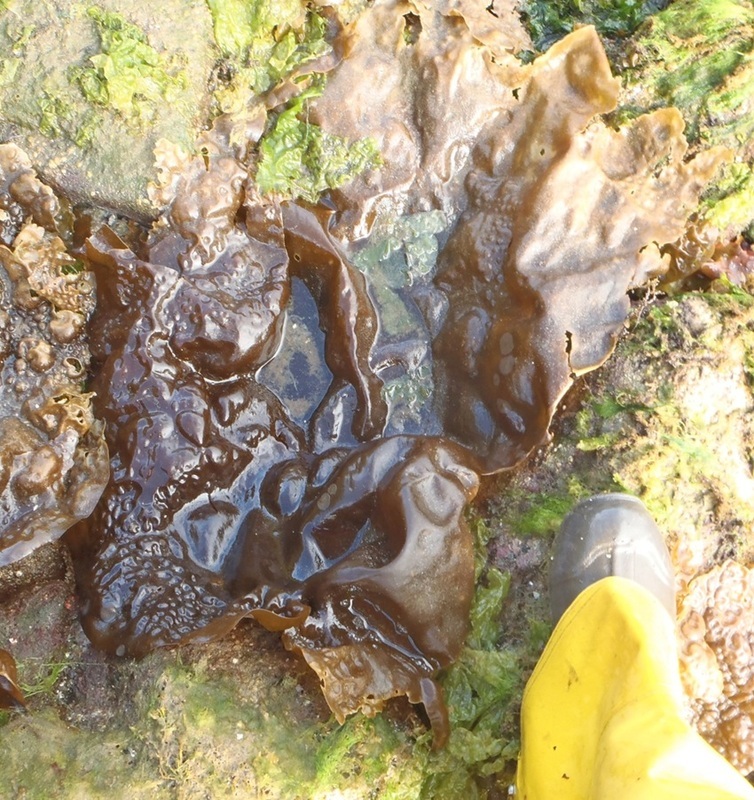 This kelp can be found in the very low intertidal, but is common in the subtidal of semi-protected and semi-exposed habitats. It attaches itself to wood, rock, and sometimes other kelp. Its range extends from southeast Alaska to Baja California, Mexico. 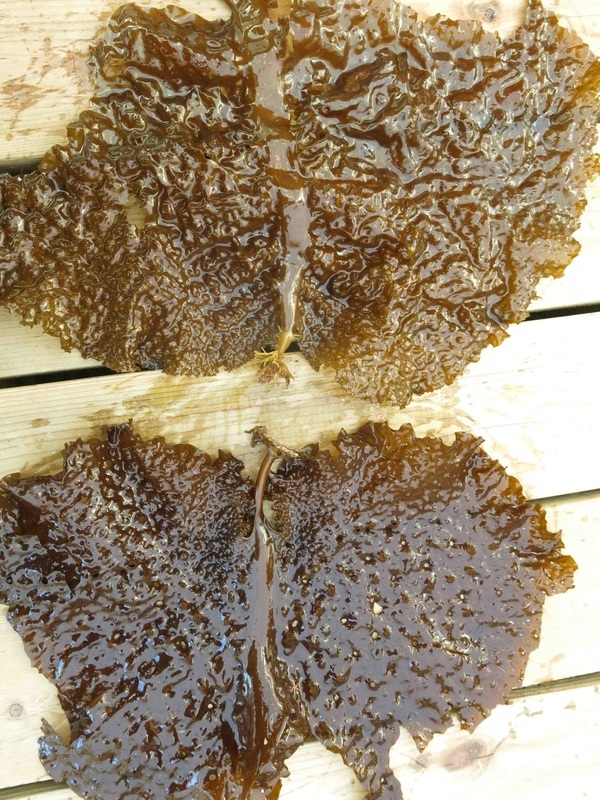 ﻿Sieve kelp (Agarum clathratum) ﻿is very similar to fringed sieve kelp. The latter has a short, flattened stipe with projections; in contrast, the stipe of sieve kelp is not flattened, does not bear projections, and is often much longer (to 30 cm). Lindberg, M. and Lindstrom, S. (2010). Agarum fimbriatum. Seaweeds of Alaska. Accessed 17/11/2014. O'Clair, R. and Lindsrom, S. Agarum fimbriatum Harvey. In Klinkenberg, Brian. (Ed.). E-Flora BC: Electronic Atlas of the Plants of British Columbia. Lab for Advanced Spatial Analysis, Department of Geography, University of British Columbia, Vancouver. Accessed 17/11/2014.